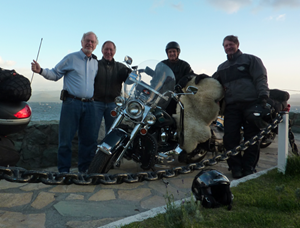 Because of other commitments I cannot continue the trip, so yesterday morning in Bariloche, Argentina, I passed the torch to our newest rider, Bruce, and I bid the new Dream Team farewell. 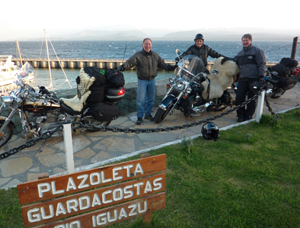 Standing by the beautiful Nahuel Huapi lake, I prayed that God would protect them. Although it’s been a year, last night I watched Brad and Doug relate to the Rodrigues family as we sat around a table at a parilla, one of Argentina`s famous meat restaurants. A year ago Henrique, Isabel, Rodrigo were strangers to us — people who had a mechanic shop, when we were in desparate need of one. Our hope was that they would be able to repair two of our bikes and then we would be on our way. Sitting together over this wonderful meal, it was evident that a bond of friendship had begun between these three riders and a family who had came to our rescue. Over this last year, the Rodrigues family very patiently cared for us when we needed advice and help and provided repairs and safekeeping for our three bikes while we returned to our homes to wait and heal from the accident. And, at the other end of the table from me was Bruce, the newest member of the Miles With A Mission Dream Team. He used the three Spanish words he knew and then plunged in to relate and entertain people he had only met that day. He was already relating like a true Hispanic. All of us that have been a part of this adventure hoped it would be fun, as well as a mission. While we have experienced our setbacks and challenges, we realize it is all for a purpose. Our prayer and commitment is that many people around the world will be blessed because of funds given by sponsors and supporters of Miles With A Mission. For the final three riders now continuing… God Speed.